Jessica Love is an illustrator and a New York based actor. She has a BA in studio art from the University of California, Santa Cruz, as well as a graduate degree from Juilliard. Refreshingly, Spanish words aren't italicized. Though it could easily feel preachy, this charmingly subversive tale instead offers a simple yet powerful story of the importance of being seen and affirmed. [Julian] is, in a word, fabulous. Love lets an anxious beat pass before Abuela takes Julián by the hand, leading him to what some readers may recognize as the Coney Island Mermaid Parade. “Like you, mijo,” says Abuela. “Let’s join them.” Love’s deep empathy for her characters and her keen-eyed observations of urban life come together in a story of love, understanding, and embracing the mermaid within us all. The luminous, lovely, and layered art is what really makes the book...The concluding parade is a confectionary wonder of marine fantasy that many kids will yearn to join, and it might prompt adults to set up their own in- library mermaid celebrations. More importantly, though, those who’ve been shy about their love for dazzle and showmanship will love the idea of a formidable grandparental ally, and they will find this encouraging and empowering. Julián’s emotional journey takes on depth through small but important details: a wary look in the mirror, a slight inward slump of the shoulders, a chin held high while marching down the street. Love uses vibrant watercolors with gouache and ink and a lively style to create scenes that splash and swirl to life on the page. Across her watercolor, gouache and ink spreads, Love captures the transformative power of being seen...Love's affecting combination of the literary and the visual results in a powerful affirmation of individuality, creative expression and unconditional acceptance. Love’s painted scenes glow against muted backgrounds, with saturated, opaque tones tracing the graceful shapes of the figures. They’re especially striking when Julián gets swept away in a vivid underwater fantasy: a school of sea creatures whirls around him as he transforms into a mermaid. That scene is nicely replicated when he arrives at the parade, which is populated by scores of people in a wide variety of inventive costumes. The affectionate depiction of a broad range of body types and skin tones makes this particularly cheery. This beautiful book is one of the very few picture books about a gender non-conforming child. Yet it feels like a celebration of all children who want to do things differently than the parental figures in their lives—and a love letter to the grownups who deeply understand them. There is nothing about this book that is forgettable. In fact, you may have a hard time not thinking long and hard about it after you put it down. A book for mermaids and boys and girls and parents and teachers and booksellers and librarians and . . . Let’s just simplify things and say it’s a book for the human race. The illustrations couldn’t be more beautiful, and I love how Julián’s grandmother accepts him for exactly who he is...I’m so grateful for books like these that help foster acceptance and understanding from a young age. 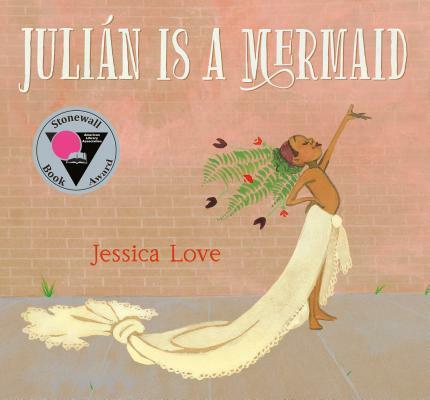 Julián Is a Mermaid makes a fine addition to the best LBGT children’s books. Groundbreaking...here’s a happy picture book that challenges traditional gender stereotypes, rendering one boy free to be himself. Right now, I just finished reading ‘Julián Is a Mermaid,’ by Jessica Love, which is an awesome picture book, one of my favorites, and I won’t spoil the end for you, but it has something to do with the mermaid parade. It’s a story of a little boy who is taken with some elegant costumes, and decides to fashion one of his own. It’s that simple, but it makes a big impression; I can’t recommend it highly enough.